Around Our Nation’s Capitol with Princess Jubilee – Happy. Homeschooling. Housewife. Today Princess Jubliee was hanging out with mommy because her big sisters were attending our church’s Vacation Bible Camp (which, by the way is awesome). Usually, I am very prepared when I know I am going to have just the little one– not because I am always super organized, but because she misses her sisters dearly when they are away and so I try to have really great activities to distract her. Well today I wasn’t organized because I got in late from a trip to Virginia to visit my sisters. My morning started off late and rushed–I didn’t have clothes set out, I didn’t have bags packed and I didn’t even have breakfast foods in the house (Oh McDonalds!). So that is why I was so surprised how easy and absolutely delightful our special time together was. After dropping the girls off, we took off walking–headed…well, I really didn’t know. The weather was perfect, sunny with a cool breeze–perfect for long walking. Isn’t that view inspiring. I just couldn’t resist! We strolled along and it was so fun to see what things caught her eye–the trees, small cracks on the side walk, a squirrel carrying a nut. And she had to say hi to every person she saw. She was glad handing in front of our Nation’s Capitol right along our congressman and senators. One of the things I love about living in Washington, DC is the ability to, at a moment’s notice, visit a museum. Today we went to the National Museum of the American Indian and she had a ball. They have a wonderful interactive area for children. This was such a neat exhibit. 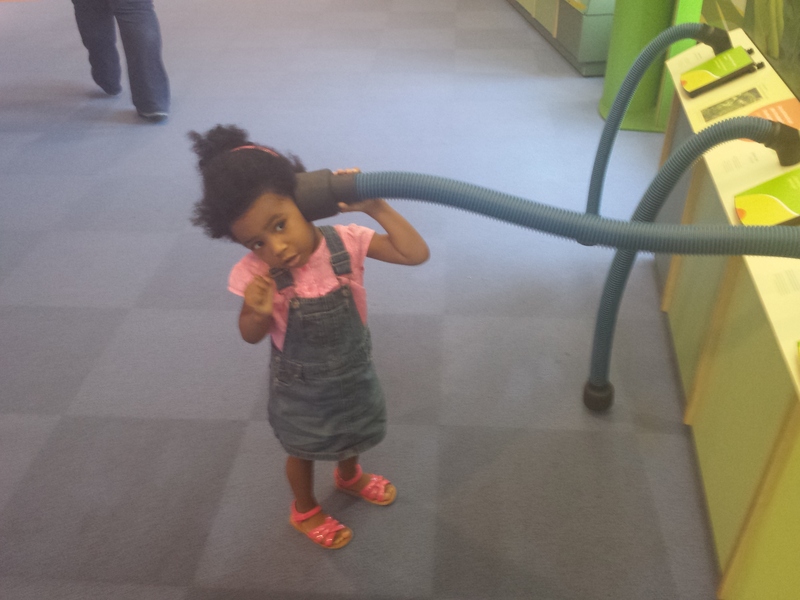 Princess Jubilee was able to hold the long tubes to her ear and listen to birds of the wetlands. She loved this! 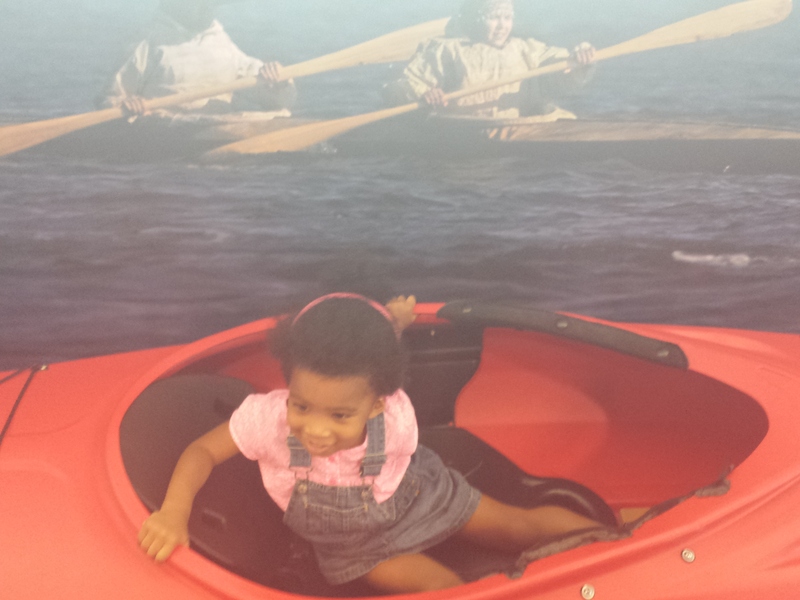 Here she is enjoying the kayak exhibit. It moved which was fun for her but she really wanted mommy to get in…maybe next time! After we had a picnic lunch. Our picnic lunch outside the Capitol Building. She enjoyed sharing with the birds. By the time we met up with the girls she was convinced she had the better day! Two more days to go…what will I do tomorrow? Previous Life is Messy…Can You Relate? What a wonderful little story… and on such a great day. Memories to be cherished. It’s not the destination, but the journey. 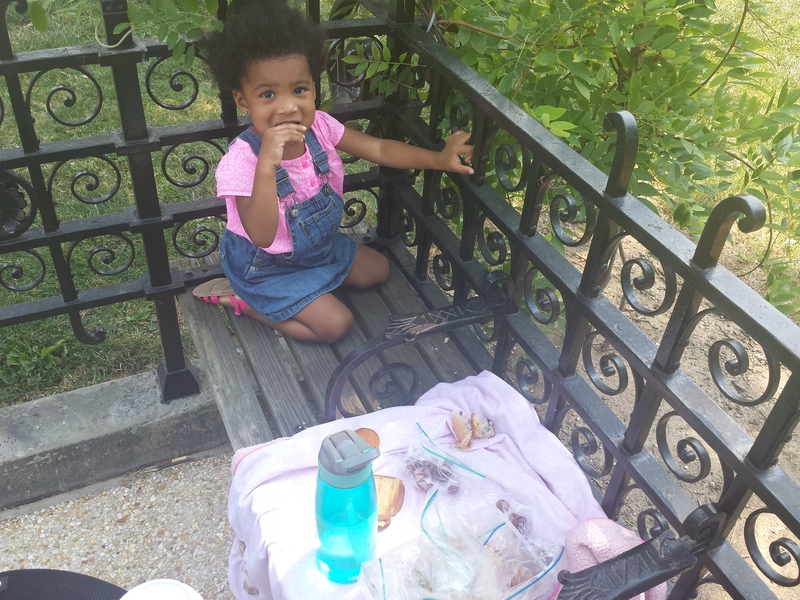 Pingback: Day Two with Princess Jubilee: The National Botanical Gardens | Happy. Home Schooling. Housewife.